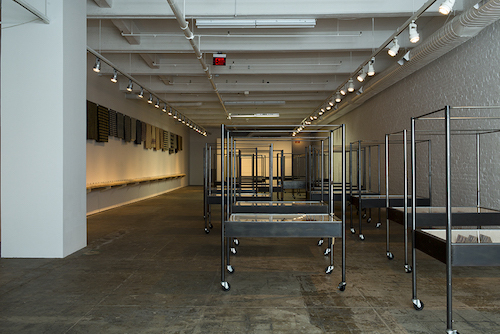 View of “Ann Hamilton: habitus,” 2016–17. Ann Hamilton’s Philadelphia miniretrospective was accompanied by a here-and-then-gone waterfront installation of pulley- and wind-activated Tyvek curtains, but the crux of the matter is on the eighth floor of this museum—a materialization of the nerve center from which springs Hamilton’s tender and spectacular whimsy. On the right side of the gallery, twenty-four steel carts function as museum cases. They look like four-post bed frames from an infirmary; instead of mattresses, though, they hold sample books overstuffed with all manner of swatches, from goat hair to lace. There, too, are twentieth-century Amish dolls, faceless and outfitted with tiny aprons and bonnets. On the left side of the gallery hang twenty-six understated checked and striped blankets. They’re from the eighteenth and nineteenth centuries, folded and hung neatly in a long row high up on the wall. Running underneath, a section of habitus • commonplace, 2016, which exists online as a Tumblr open for submissions, is set up as a shelf with stacks of takeaway printouts of images and literary quotes related to the human experience with cloth. There’s an excerpt by Alice Walker about lavender quilt pieces from her mother, another by Sylvia Plath about her protagonist feeling uncomfortable in expensive duds, and another by Eileen Myles about a madras shirt faded to resemble paisley. Hamilton proposes: We are fundamentally intimate with blankets, pockets, tablecloths, and windbreakers. Yet the police lieutenant’s soft hat, the voting booth curtain, and the forlorn sofa’s tattered upholstery threaten to inhibit our imagination. Perhaps these objects might as well be fleshy and alive.